Nottinghamshire’s overseas signing for most of their domestic cricket in 2018 will be a batsman, it has been confirmed. The Trent Bridge club have already secured their two non English-qualified players for the T20 Blast, which is to be sponsored this summer by the insurance company, Vitality. They are skipper Dan Christian, who led the team to glory at Finals Day at Edgbaston last year, and spinner Ish Sodhi, who also played in last summer’s winning team in the 20-over format. And now, director of cricket Mick Newell has announced that an overseas batsman will be sought for the campaigns in both the Specsavers County Championship, after Notts won promotion as Division Two runners-up in 2017, and the Royal London One-Day Cup, which they won last year after a memorable final at Lord’s, spearheaded by a remarkable innings from Alex Hales. The decision had been delayed until the conclusion of the Indian Premier League (IPL) auction because it would then be known who would be available for a full summer in England. Newell said: “We have decided to go for a batsman because we want to strengthen that area of the team. We have put in a couple of offers. “It’s always difficult to make a move before the IPL auction because you just don’t know until after that has taken place who is going to be available. Last season, the overseas player role for the county championship and the one-day cup was shared by Australian pace bowler James Pattinson and Indian batsman Cheteshwar Pujara. 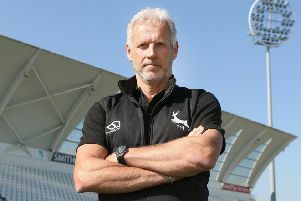 But given that Notts are now determined to land just one batsman, it is probable that the new recruit will be more high-profile and ready to slot into the top order when the season begins in April. They open their four-day campaign in the top flight with a trip to Emirates Old Trafford to play Lancashire on Friday, April 13 and return there to begin their defence of the Royal London One-Day Cup on Thursday, May 17. Other early county championship fixtures are away to Yorkshire at Headingley in Leeds from Friday, April 20 and away to Worcestershire at New Road, Worcester from Friday, April 27. The first home match is against Hampshire from Friday, May 4.